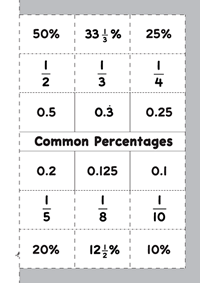 I recently made a Percentages Foldable (common percentages and their fraction and decimal equivalences) to include in our school newsletter. The idea was to encourage students (or parents) to make the foldable and put it on the fridge, or somewhere else prominent, to encourage the remembering of some common percentage comversions. I’m trying to make the time to create foldables to use with my Year 11 General Mathematics class. The topic DS1 Statistics and society, data collection and sampling lends itself to foldables.